Victory to Thee, o Lord Sai Rama! Kindly saturate our hearts with love. For us Thou art the only refuge. Thou name and glory engulfs the entire world. Chant the names of Lord Gopala, Sai and Sathya Sai Gopala. mother Yashodâ and Nanda (foster parents). 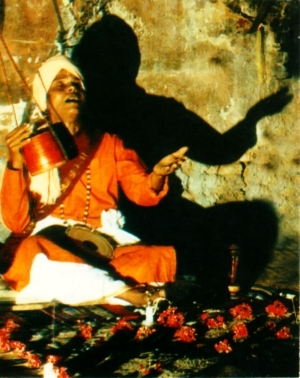 Bauls are wandering minstrels from West-Bengal who travel from village to village, longing for mystical union with the divine through ecstatic singing and dance. Their Philosophy, which reaches back to the advent of the god Chaitanya Deva six hundred years ago, is based on Hinduism as well as tantra-buddhist and sufi-islamic elements. Bauls express their thoughts through worship songs in simple language clothed in homespun words and metaphors of village folklore. The word Baul is derived from the ancient sanskrit word ëbatulí: mad. Mad about the soul of God within ourselves, whom we have to perceive and realize through inner enlightenmentî. Bauls believe in love for humanity, irrespective of culture, social level, faith or color. Love for all human beings is their path leading to divine love, and they consider God as the eternal lover of the eternal woman which is the human soul. Ektara: drone instrument, plucked while singing, whose unique string symbolizes unity with God. Baaya: small bowl-shaped drum tied to the waist. Bauls play the baaya and ektara together. Khamak: wooden drum with two strings attached to the skin. Nupur and Ghunghur: ankle rattles and bells used to emphasize the rhythm while dancing. Dotara: four-string instrument used throughout West Bengal and Bangladesh. The sun and the sunlight are Divine. Cool rays of the moon are Divine. for the purification of the fallen. O ever Merciful and Compassionate Lord! for we are helpless without Thee. Sing the glory of Lord Govinda, oh, you ignorant person. Go on chanting the name of Lord Govinda. will not save you when death faces you. Why again birth, again death and again birth? Seek Govinda, seek Govinda, oh fool. O mind! Chant the name of Lord Rama and Lord Krishna. Victory to Lord Rama, the Jewel of the Raghukula dynasty. Victory to Lord Krishna and Lord Sai. "Harey Ram Harey Ram Harey Krishna Harey Ram"
the Lord of Puttaparthi,Dwaraka and Shirdi. He is always granting happiness to all. Who wears sacred holy ashes. Who is decorated with the moon on His head. (representing the three phases of time, space and attribute). O King among the dancers! Virtuous persons adore and worship Thee. O, easy to please Lord Sai Baba! Thou art the treasure of mercy and forgiveness. and those who have no one to help them. Lord Baba, Thou art always blissful, happy and loving. "Have Ananda (joy) in your heart. pure hearing, pure speech and pure actions. that day will be My Birthday for joy. I must tell you another fact. great difficulty during the journey. I have no desire to have My Birthday celebrated. Such trivial thoughts can never enter Me. with you, to encourage you to lead lives full of Ananda. My Birthday is when you get Ananda." Lord Hari, and Lord Narayana. Who is extremely compassionate and merciful. O creator of the entire universe! Dwaraka, Shirdi, and Prasanthi Nilayam. Who will save me other than you Oh descendent of Raghu. I can’t leave your lotus like feet Oh treasure of mercy. Oh, the one who is worshipped by great ones starting from brahma, why are you so aloof? You are the only one who can save me. If you yourself show aloofness, what can I do? My diction is inadequate even to praise and sing your story, I am in such a poor state. Please clear my worries and grant my wishes and save me. by Hanuman, why don’t you listen to my lamentation? Cleansing me of all my sins, and without leaving it, holding my hand firmly, who will save me, other than you?